Wow, you're reduced to that type of thing now? Lying about people isn't a good trait Tam. As I said, if you were more careful to think for yourself, you wouldn't have been so easy to fool with a crude photoshop fake. What have I lied about? Be specific. You are calling a man a homosexual with nothing credible to back that up with. Barbie still thinks it was some photoshopped pic that most of us have just now seen is the reason we know Obama swings with men. I know you abandoned it when you realized you had been tricked. But since that's all the evidence brought forth, the question is "if it's true, why do people feel the need to lie to convince us?" Don't be so easy. Think for yourself, and check the sources. Here's a hint: if you really, really want it to be true, that's the time to be very careful to check it out. Give him a few weeks and maybe he will catch on. Granted, that's a slim 'maybe'. Given that Barbarian isn't prone to silly blogs and rumor mongering as "evidence" then it's a safe bet he won't "catch on" to what silly little cranks like to peddle as if it's some unspoken truth. You're simply lying about a man with nothing of any substance to support it. I was not fooled by a crude photoshop fake. I already knew Obama was a homosexual before ever seeing the image. You, on the other hand, are so gullible that you fell for a crude photoshop Disinformation campaign. You think a photoshopped image on the internet proves that Obama is not a homosexual. So, do tell, how did you "know"? Be specific as to how you can be so certain and supply some credible evidence to support that. You were pretty upset when it was shown to be a fake. That's a tip-off in itself. There's only one way you could know that for sure. Maybe he just told you he was Obama? You're still upset that I called you out on it. I'm sure it was a shock to learn that they fooled you so easily. Nope. I'm just pointing out that when you catch people in a lie, it's a good indication that they are liars. Think about it. And learn from it. I posted a thread about Obama being a homosexual on this site many years ago with excerpts from the articles that exposed him. It was deleted in the purge of old threads. Then you should still be able to repost the same irrefutable evidence again anyway? You were pretty upset when it was shown to be a fake. More lies from The Barbarian? The Barbarian constructs a strawman argument around a photoshopped image I never referenced. The Barbarian is easy prey for any hustler with a story to tell about Trump. 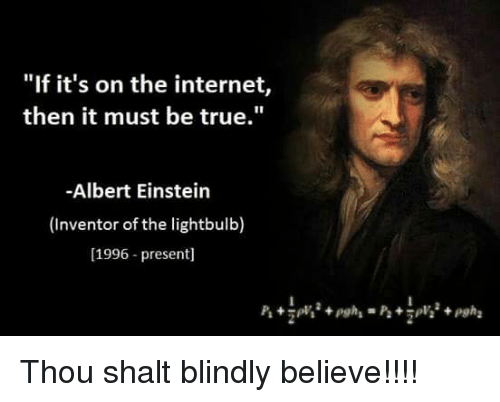 There is no such thing as "irrefutable evidence" on the internet.